Glad you visited us! 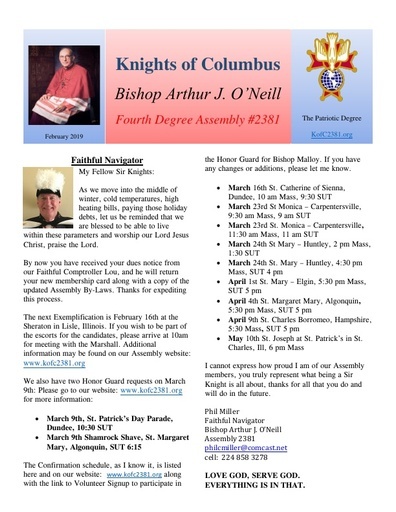 We are the Knights of Columbus Fourth Degree Assembly #2381, a Catholic Fraternal organization. 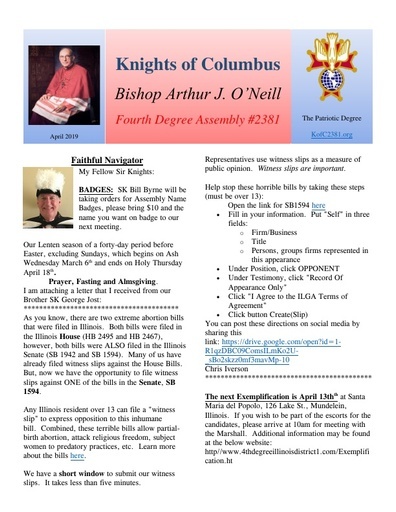 Highlights of videos from the Knights of Columbus Supreme social media hub. All tickets sold online or via phone will be will call at the door the day of the event. Bishop Arthur J. O'Neill Assembly #2381 began with Elgin who chartered in 1902, Carpentersville chartered in 1962, Dundee chartered in 1984, Algonquin chartered in 1992, Huntley chartered in 1997 and Hampshire chartered in 2002. 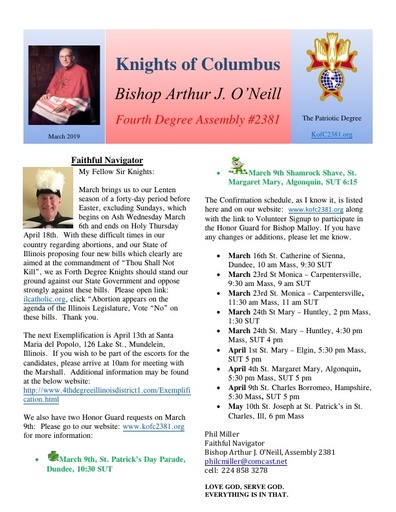 The 4th Degree of the Knights of Columbus is the Patriotic Degree, we honor the local Bishop in attendance at masses and other events and add dignity and respect to various ceremonies and events with our color corps, honor guard and color guard. We meet the fourth Tuesday of each month at 7:30 P.M. Officer SUT is 7:00 P.M. Meetings rotate at parishes of each council represented. Please open each link to volunteer, thank you.